Have you ever dreamed of hiring a deck builder to create an outdoor living area in your Glen Carbon, Illinois yard? A deck can provide the perfect place to entertain family and friends on the weekend, grill dinner, or just relax after a hard day at work. 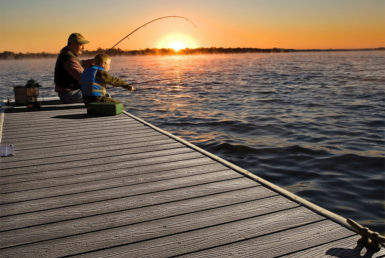 What’s more, as a premier deck builder, homeowners can choose from two types of decking for their outdoor living space – wood and synthetic decking. We offer two different wood decking options, premium cedar and treated lumber, both of which can be stained and sealed, as well as two synthetic decking options – a PVC cellular option that is plastic throughout and Tamko Envision® PVC coated composite decking, both of which are durable, low-maintenance, and resistant to scratching, splintering, fading, and mold and mildew build up. To learn more about why you should choose Chesley Fence & Deck as your deck builder, contact us today. We proudly serve all residents of Glen Carbon, IL and surrounding cities.